Norton Motorcycle Company formerly known as Norton Motors Ltd has been renowned for the mean and sleek beauties the British have been known to produce. 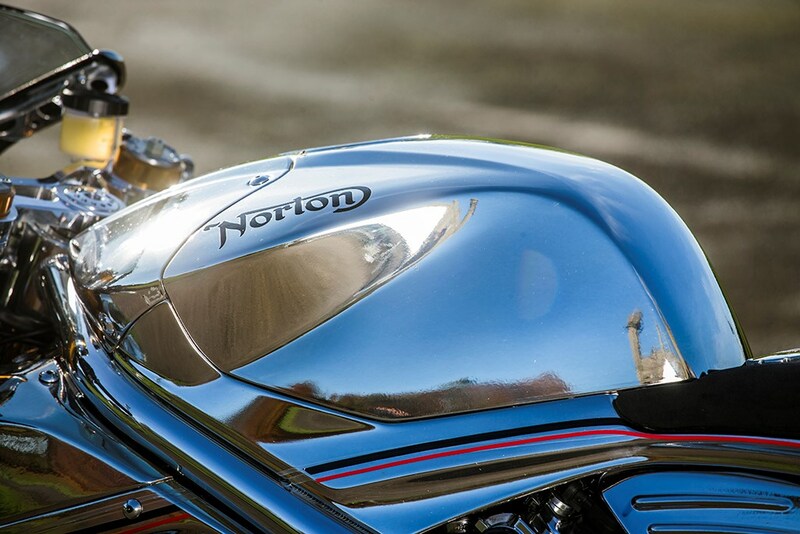 Norton is a British brand of motorcycles firmly anchored with a strong racing tradition. They trace their first win as far back as 1907 during the Isle Of Man TT under the expert hand of a rider Rem Fowler. 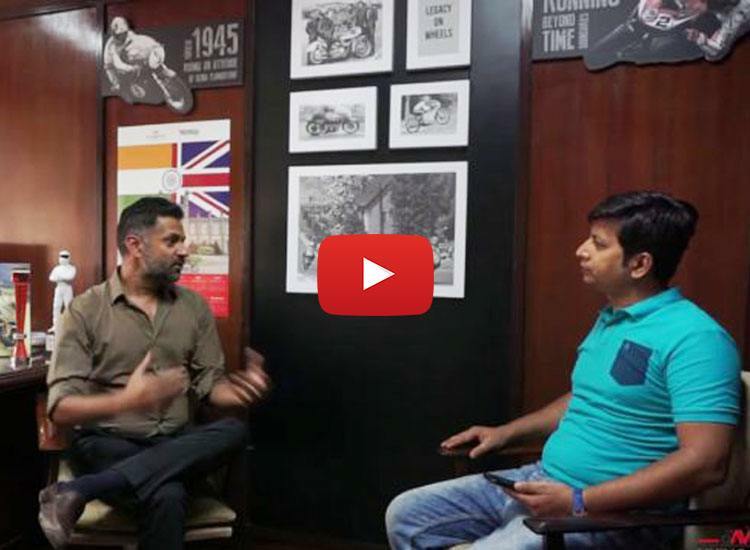 They have enjoyed are unique place in motorcycle history and keep on drawing their inspiration from the past while striving to break new records and make astounding progress in the future. 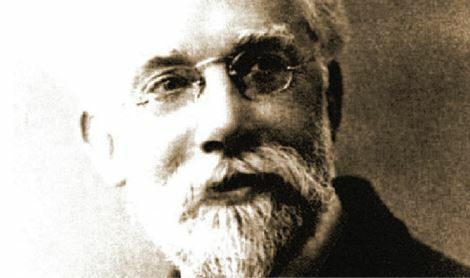 Founded in 1898 by James Lansdowne Norton, they produced their first motorcycles however using French and Swiss engines in 1902. Cementing their reputation as builders of race and road bikes was not a hard task as they won a few titles of their own in 1907 (Isle of Man twin cylinder class), putting their name in the tabloids. But since then they really wanted to stand out and maintain their reputation, they built their first Norton engine bike in 1908. 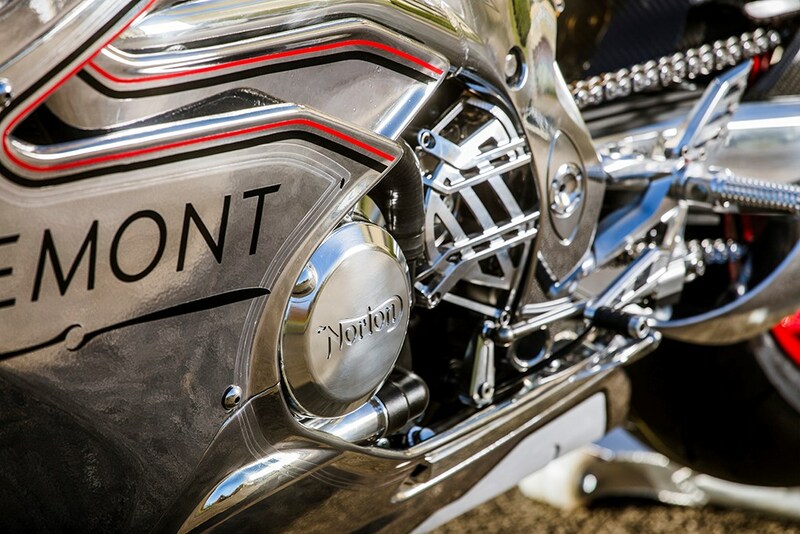 The Norton logo was first stamped on bikes in 1916. In mid 1930s they boasted the production of 4000 road and racing bikes per year. But then they focused on the creation of road bikes during the WWII and became the supplier for British Military bikes. The twin cylinder Dominator and the feather-bed frames are a few of their successes in the 1940s and 1950s. 1961 saw the invention of the Commando which was rated machine of the year for five consecutive years by the Motor Cycle News readers. 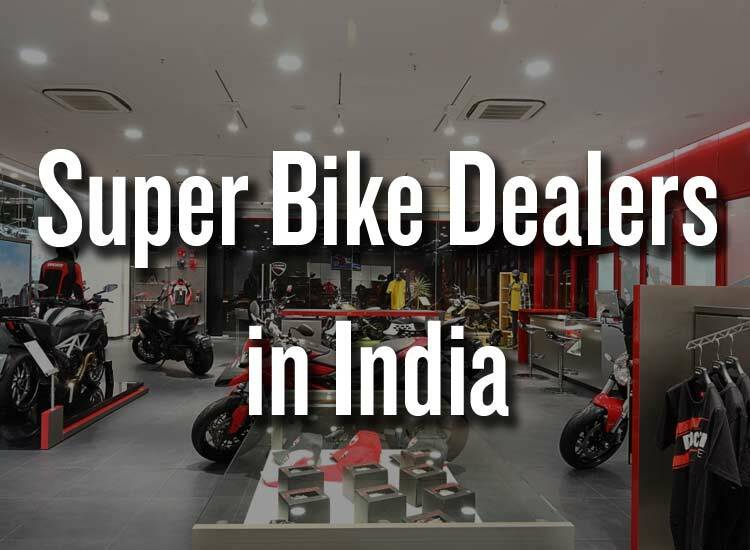 Their market witnessed a downward slope in the 1970s which was later re-instituted in the year 2009 with the winning of the World Speed Record for a Rotary Powered Motorcycle (173 mph for a timed mile). With the delivery of the Commando 961 in 2010, the return of Norton motorcycles on the market was assured. The desire of Norton to enter the superbike market has led to the further invention of the SG1 as well as the V4 SS and the V4 RR. The new V4 project was dubbed with the code name P94 as a tribute to the number of times Norton has won the Isle of Man TT race. 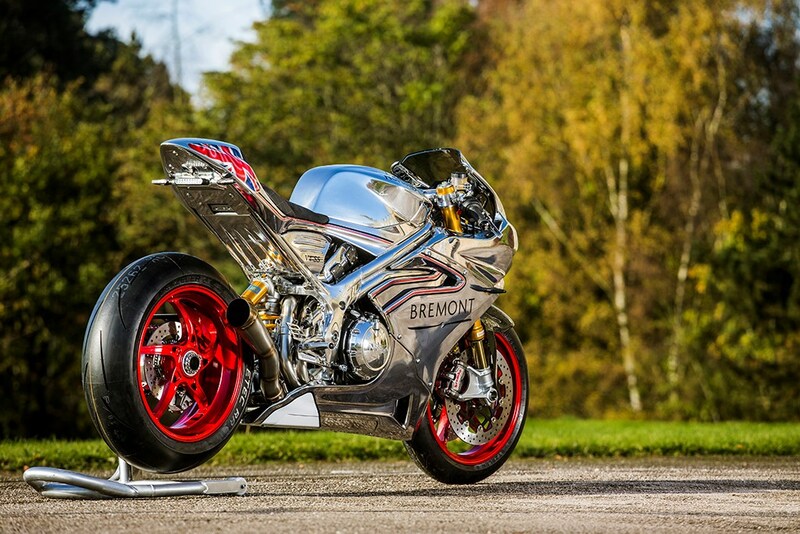 It was in 2016 that Norton presented in Milan their two handmade and designed superbikes to the public. 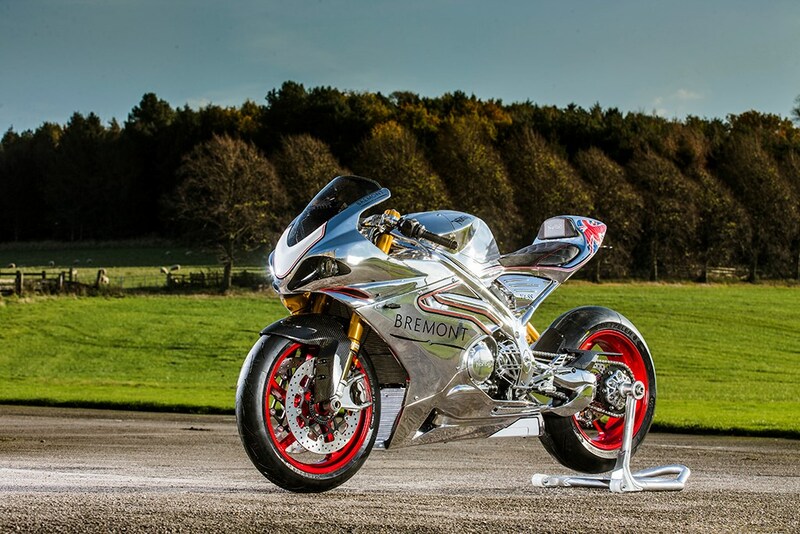 The new Norton V4 SS and Norton V4 RR are the most technologically advanced British road motorcycles that have ever been produced which come in two forms: The limited edition V4 SS and the exclusive V4 RR. Once launched, the V4 SS sold out in days. 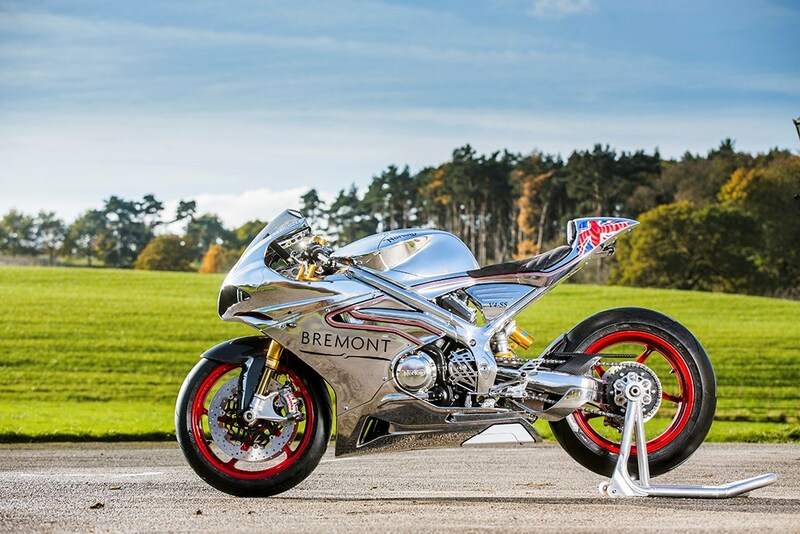 What inspired this team to make such a beauty was the 118 year history that Norton has in building superbikes as well as a combination of competent British engineers and some design techniques used by British supercar manufacturers. 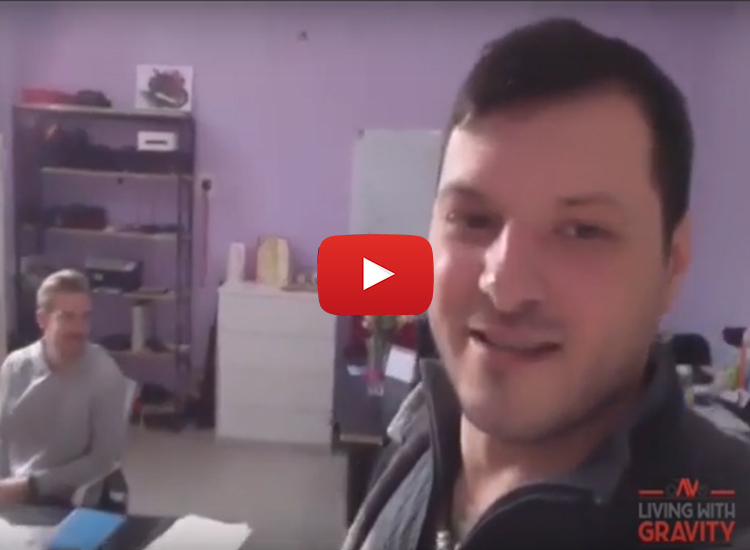 With this new invention Speed is the motivating factor. 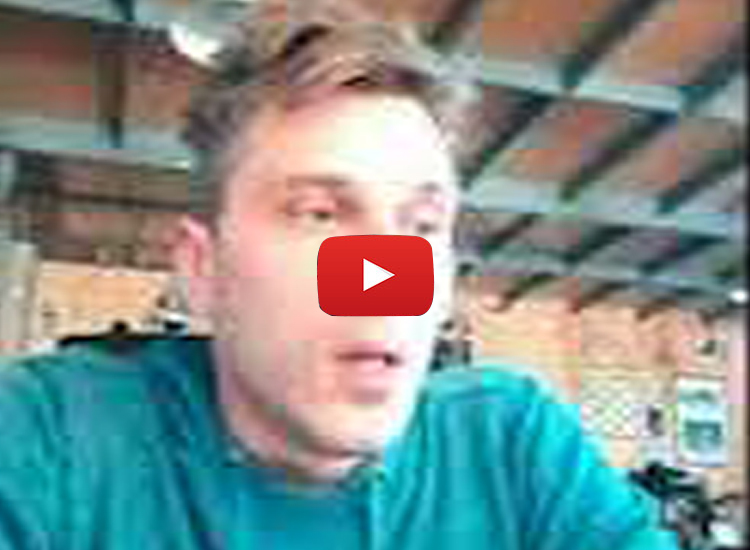 Exceeding 200 mph is not uncommon with these machines. Weighing an astounding 179kg making them lighter than the machine from which they are derived; they also possess a 200bhp and 1200cc engine. 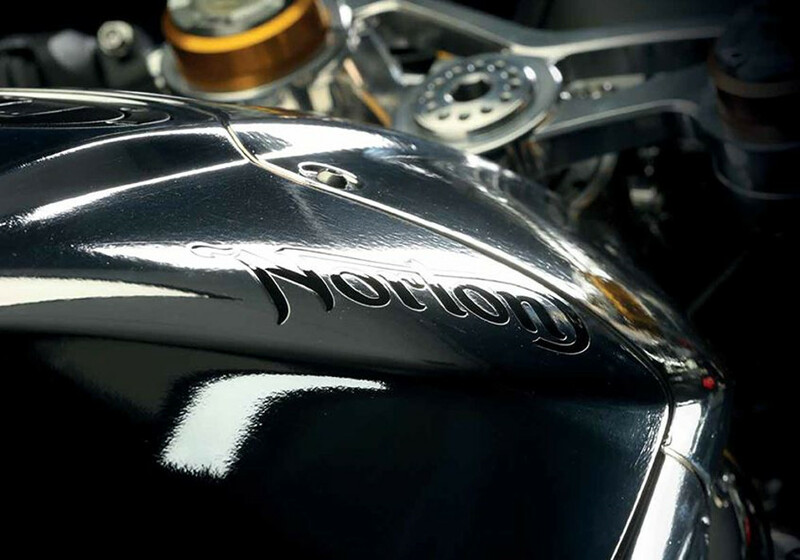 At the center of the Norton V4 SS is the new V-shaped 72 degree 1200cc engine with a bore of 82 mm and a stroke of 56.8mm. With at least 150 kw power it records 200 hp at 12,500 rpm at maximum output. Originally the engineers wanted to obtain a 90 degree V configuration on the engine in order to avoid the need for a balancer shaft but they later realized that the 72 degree angle worked better for the V4 RR’s chassis geometry. They say the engine is similar in size as the former Norton’s well known Isle of Man TT racer. The engine was developed at the same time as the entire bike design in order to stay true to the authentic Norton heritage of 1898. The valves of the V4 engine are titanium based with a gearbox that is modeled after a cassette type with 6 speeds. 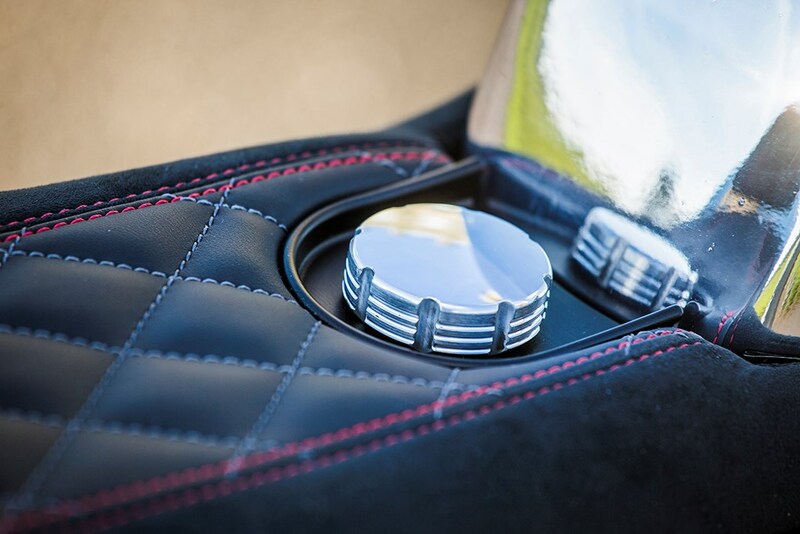 The anti-rebound clutch is designed to make driving the sports bike easier. The intakes of variable length are comprised of eight injectors and a complete ride-by-wire accelerator system. It makes a whooping 130 Nm of torque at 10,000 rpm. 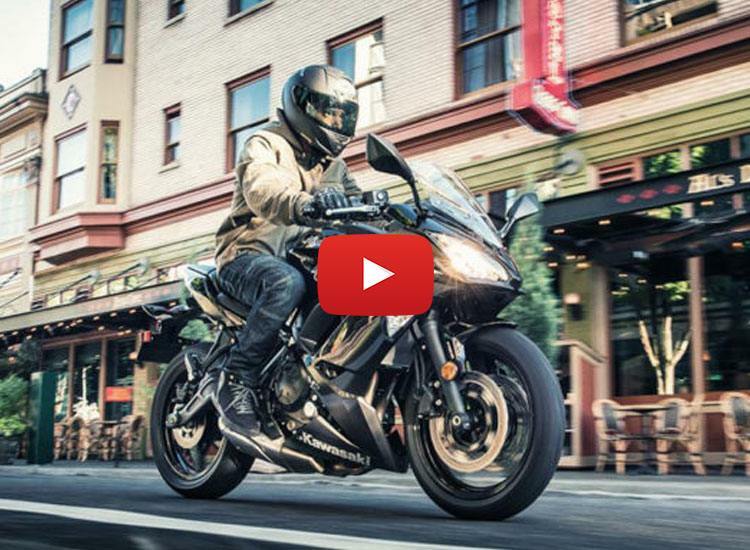 The V4 power is tamed by an electronic rider-aid package that Norton developed. 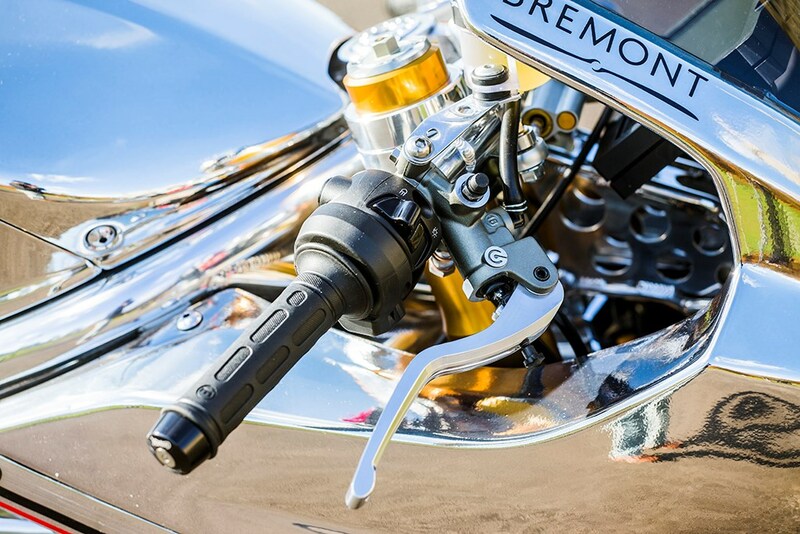 The Norton SS comes with traction control, launch control, cruise control wheelie control and even engine modes (Road, Sport and Pro-Race) and lastly an adjustable engine braking system. 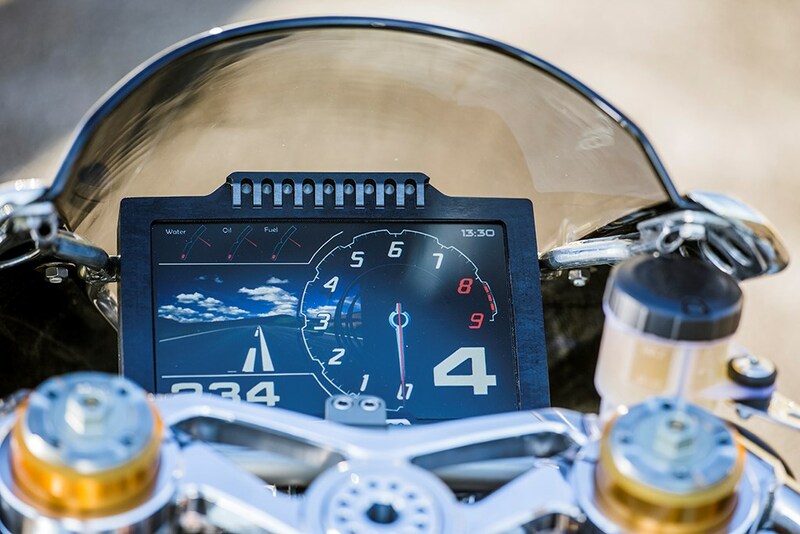 Furthermore the 7 inch display screen has included a rear-view camera for road mode only. The data registration system shows maximum lean angle, maximum speed, lap times, maximum throttle; with its slipper clutch and quickshifter for clutchless up and down shifts with an incorporated blipper. 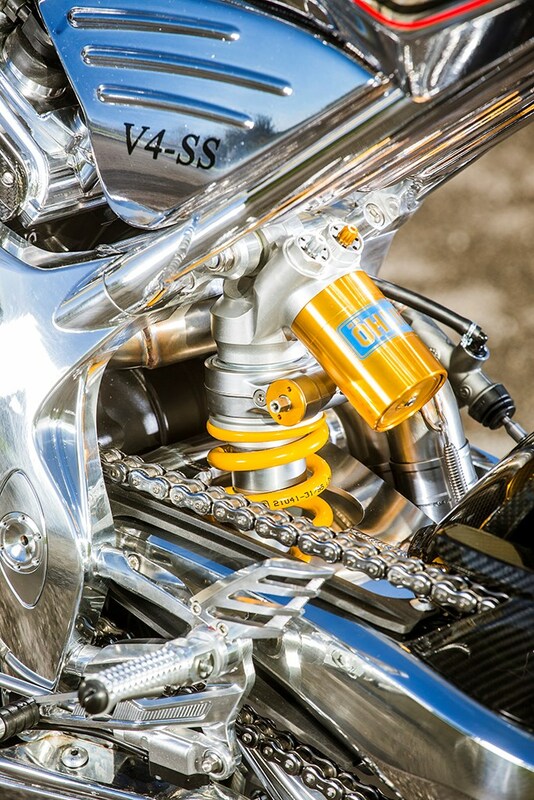 The suspension is a mix of Ohlins NIX30 forks and an Ohlins TTXGP rear shock, which are both adjustable. The single – sided swing arm and steering head are also adjustable. 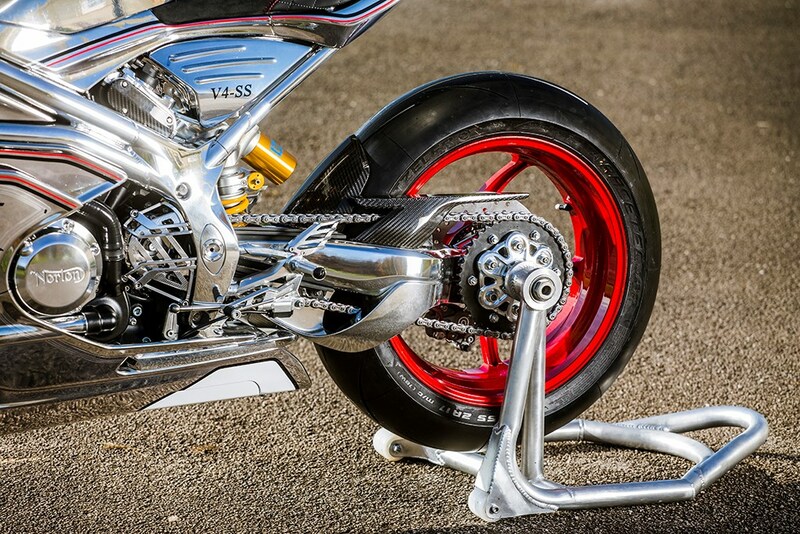 The bike also makes use of an Ohlins steering damper as well as a keyless ignition billet forks and pegs. Furthermore it has a full LED lighting system including super bright high beam and low beam, angel eye DRLs, indicators and rear lamps. 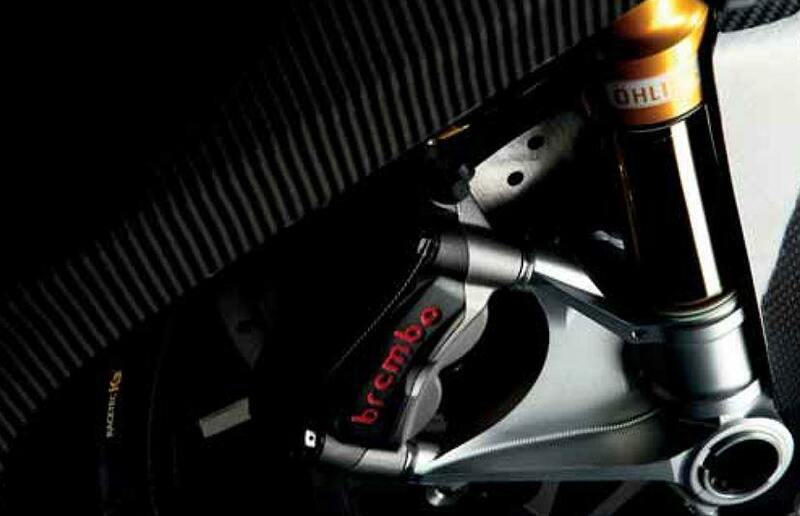 Brakes are two full floating Brembo discs measuring 330mm, with Brembo monobloc calipers which are radially mounted on the front and a Brembo master cylinder. In the brakes at the back we have a Brembo single 245mm disc and a Brembo caliper with a master cylinder. In the V4 RR the front and back wheel are made up of forged aluminium. The bike bears a forged footrest, foot plates as well as a carbon heel guard and a cast sprocket cover. In order to optimize the weight distribution in the V4 RR bike they employed a two-split radiator in which one could find an additional air cooler. As such the electric fan was placed in the lower part of the radiator and the motor was moved forward thus evenly distributing the weight of the engine and its components in the bike. That notwithstanding the engine is liquid cooled.It is Euro 4 Full compliance including oil thermostat, knock sensors, secondary air injection and EVAP.In addition to this, Norton offers as an option a weight saving race exhaust system made out of titanium, saving up to 8kg in weight and adding approximately 10 extra cv of power. On the down side this escape system cannot be used on public roads. The Norton V4 owes the narrowness of its frontal profile to the ingenuity in the packaging of the engine. 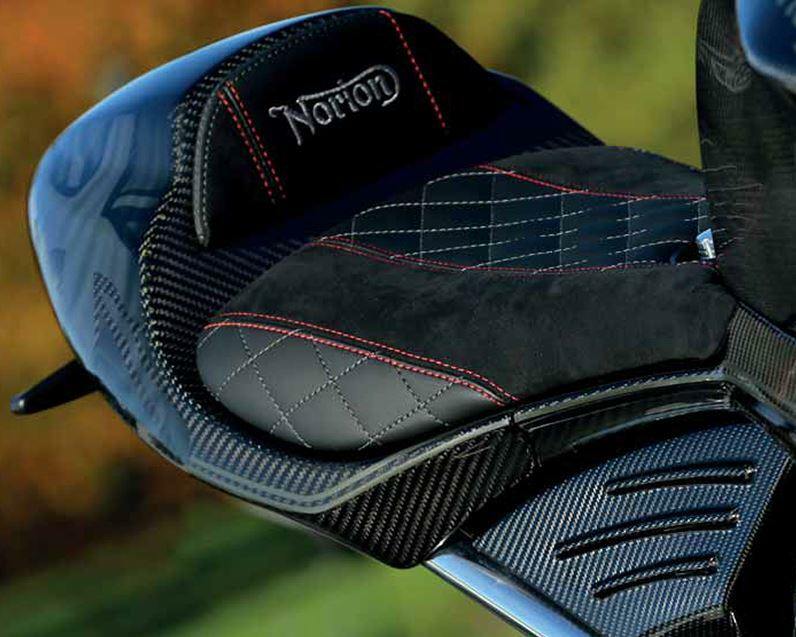 It has a Moto GP type seat made entirely of carbon fiber, a Kevlar reinforced 18 liter fuel tank for impact resistance and which is also chemically coated on the inside to meet the standards of fuel resistance. On the other hand, the air filter box is formed with a part of the lower base of the tank. 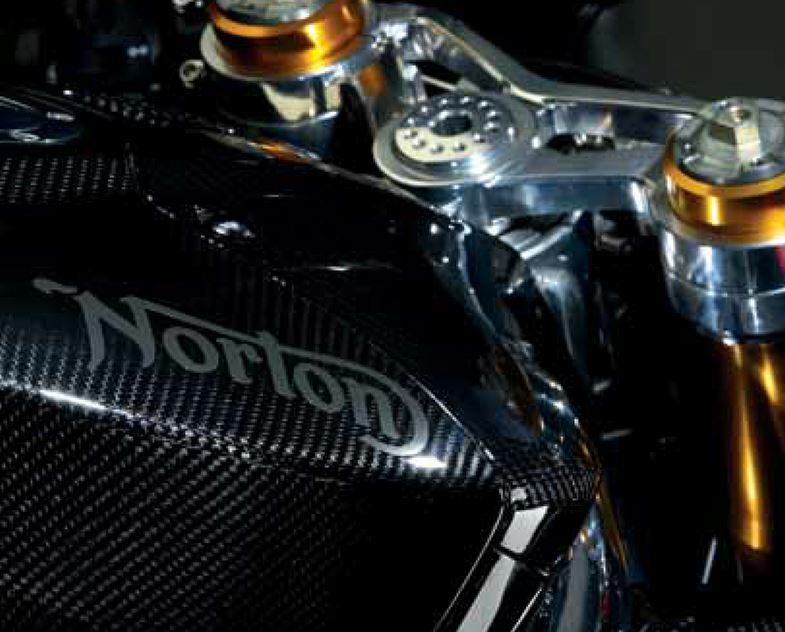 Even though there is an increase in the use of carbon fiber in creation of bikes, the Norton V4 happened to be the only one at that time to make a carbon fiber fuel tank. The electronic fuel injection system bears constantly variable inlet tracts with 8 fuel injectors. It possesses a full drive-by-wire system which is independent of the front and rear banks of cylinders for ultimate control and feel and flexibility. Though the main frame of the Norton V4 is copied from the SG5 race bike, it was built to respect characteristics of its own and to stand out as a unique and different bike. The basic main frame is a hand built polished aluminum twin tube shotgun chassis as is the case of the SS and a cast frame and swing arm as well as a cast iron stabilizer in case of the RR. The swing arm in the SS is built to supply extreme rigidity and to lower the center of gravity to facilitate the balance. The frame also happens to be 3kg lighter than the SG5 from which its design is copied. It features an adjustable headstock angle and swing arm pivot. The stabilizers in the Norton V4 SS are made from aerospace grade 7020 aluminum blocks specially engineered for motorcycle frames according to aerospace quality standards. The frame is handmade and also polished by hand to a mirror finish. The chassis is fully adjustable with a swing arm pivot and adjustable rake angle. The swing arm is braced and under slung, 570mm long. The wheel base measures 1430mm. The 23.9 degree steering head angle is a standard factory setup. 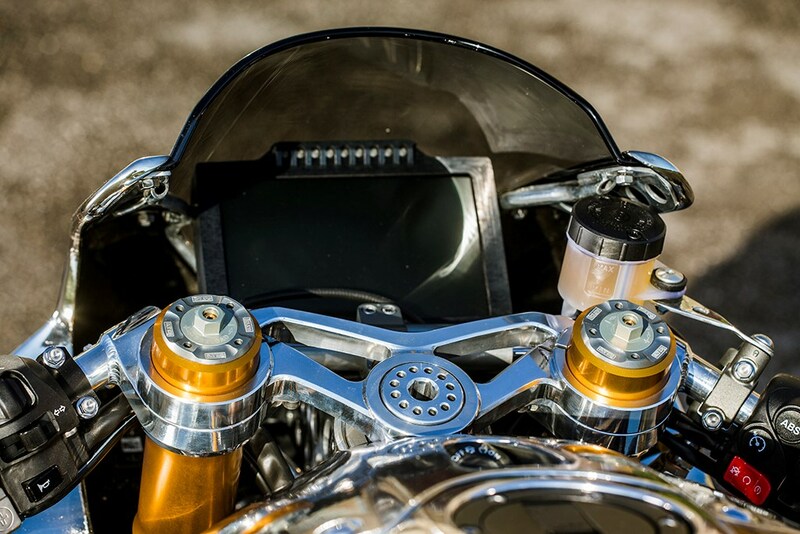 The motorcycles boast of a keyless ignition system. 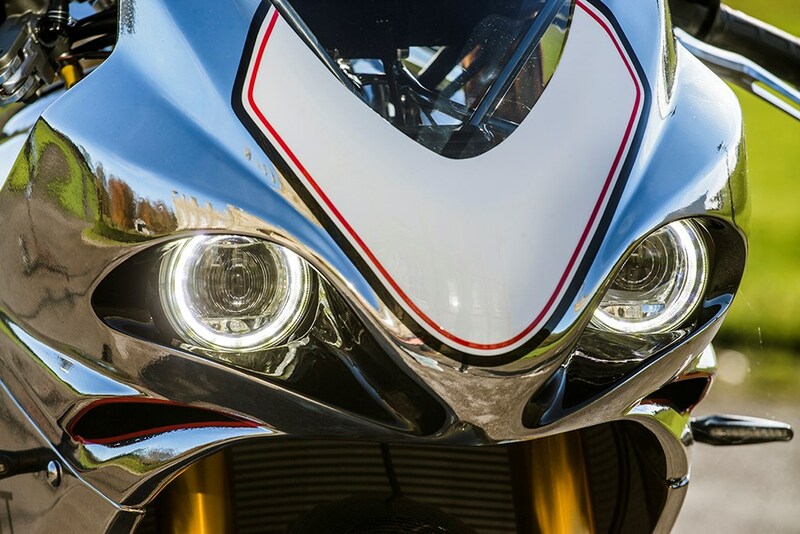 The chassis owes its design to the world’s toughest race track; the Isle of Man TT. The V4 makes use of the Bosch six – axis Inertial Measurement Unit (IMU) which gives the rider total control on the 200 + bhp the bike offers. The control is presented at various levels: cruise control, multi-adjustment traction control, anti-wheelie, launch control with an incorporated data registration system for circuit usage, strategies for engine braking, gear reductions with auto blippers, fly – by – wire accelerator or throttle with all this being controlled through a full color high definition 7 inch screen. The RR model rolls on OZ wheels which are extra lightweight while the SS model uses carbon fiber wheels which further reduce the weight of the wheels by an extra 1.7kg. This weight reduction increases agility on the road and as well as the race tracks, reduction in moment of inertia and unsprung mass. 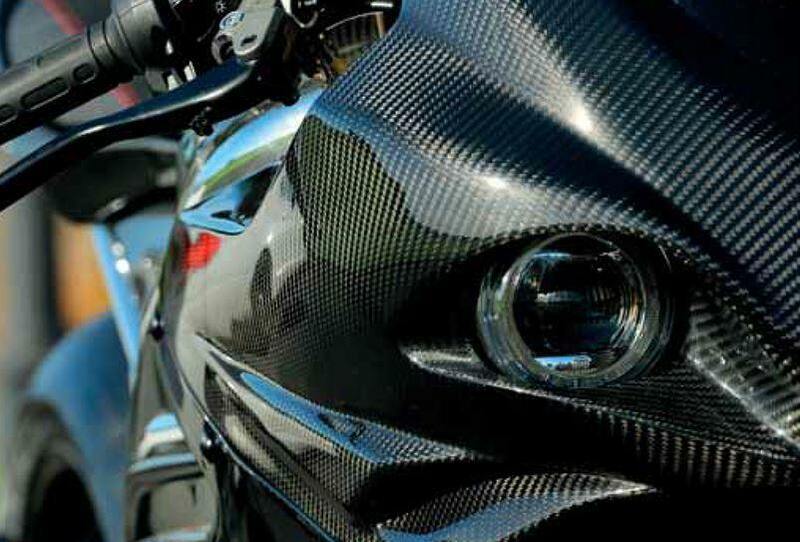 Carbon fiber is mainly what you will find on the body of the Norton SS and RR; the main fairings, the nose section, the fender as well as the tail unit are created in carbon. 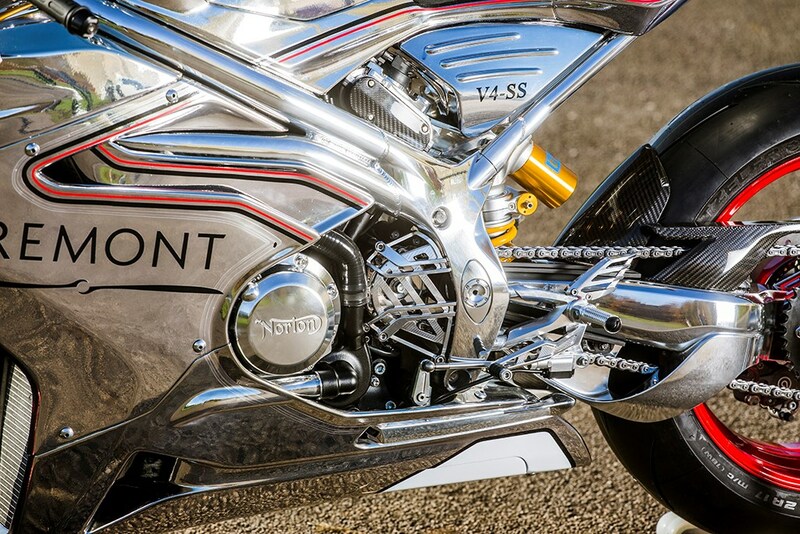 The SS is a brilliant plain carbon while the RR presents a finished chrome effect which is a TT replica. While Norton bikes have been known to build British retro bikes, they have turned a new page and given consumers something different, something tasteful and something much faster. 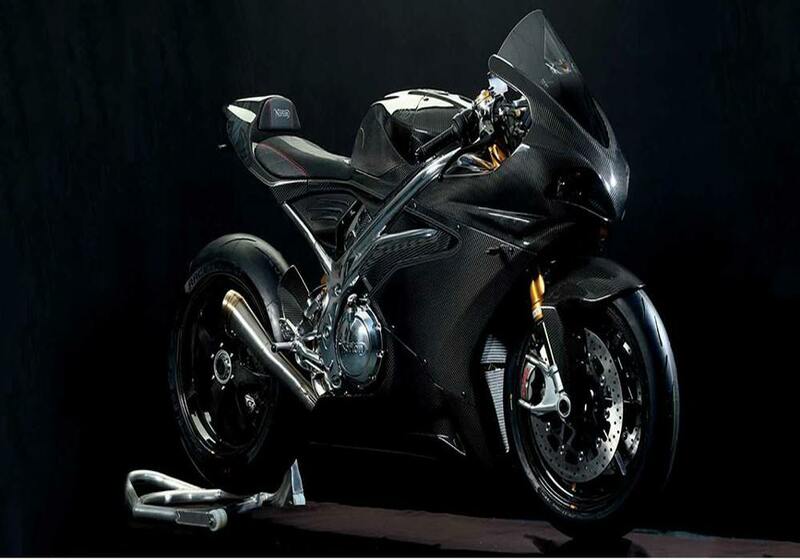 They have virtually built something worthy of being described as a two-wheeled Aston Martin, a bike worthy of competing with the Ducati and they believe they will be producing a much better high tech model. The limited edition SS was built with just 200 models produced as compared to the cheaper standard V4 RR model.